Adobo is one of the staples of Filipino cuisine. Your basic adobo is pork or chicken or both simmered in vinegar, soy sauce, laurel leaf, garlic and peppercorn. Ah, that is what Taytay folks call adobong-maynila. My kids never learned to eat adobong-maynila.This recipe is basically the same but with a little twist, making it "Adobong Taytay". Combine pork, vinegar, 3 cloves garlic, salt, water in a pan. cover it, let it boil. when it's boiling, turn heat to med-low, let it simmer until the vinegar mixture is gone. turn heat to med-high or high. In Pinoy idiom: patuyuin mo ang baboy at papulahin. Cook the adobo down until it released its oils and browned in its own fat. When the pork is fried/toasted according to your taste/specs, set aside the pork. Saute garlic, onion and tomatoes. add a little "patis" for seasoning. Make sure that the tomatoes are real cooked (skin peeling-cooked) before you add the pork cubes. Mix the pork well and let it simmer for 5-10 minutes. Luto na! Kain na! I love adobo. I even bought this AdoBo Book by Nancy Reyes Lumen. I think I've tried 10 recipes from that book. I'll be trying this recipe. hhhhhmmmmmmm, i haven't cooked adobo in weeks! 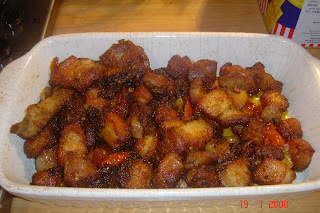 matry ko nga tong recipe na to very soon...now i'm starving!!! !